“Test 2,” (2015). Mixed media on canvas. 62 x 48 inches. Courtesy the artist and Hauser & Wirth, Los Angeles. Photo: Joshua White. “Dead Hummingbird,” (2015). Mixed media on canvas. 84 x 108 inches. Courtesy the artist and Hauser & Wirth, Los Angeles. Photo: Joshua White. “Lights and Tunnels,” (2015). Mixed media on canvas. 84 x 108 inches. Courtesy the artist and Hauser & Wirth, Los Angeles. Photo: Joshua White. “The Next Hot Line,” (2015). Mixed media on canvas. 84 x 108 inches. Courtesy the artist and Hauser & Wirth, Los Angeles. Photo: Joshua White. “Untitled,” (2015). Mixed media on canvas. 144 x 144 inches. Courtesy the artist and Hauser & Wirth, Los Angeles. Photo: Joshua White. “Rebuild South Central,” (2015). Mixed media on canvas. 43 x 96 inches. Courtesy the artist and Hauser & Wirth, Los Angeles. Photo: Joshua White. Photographer: Stefano Galli at stefanogalli.com. 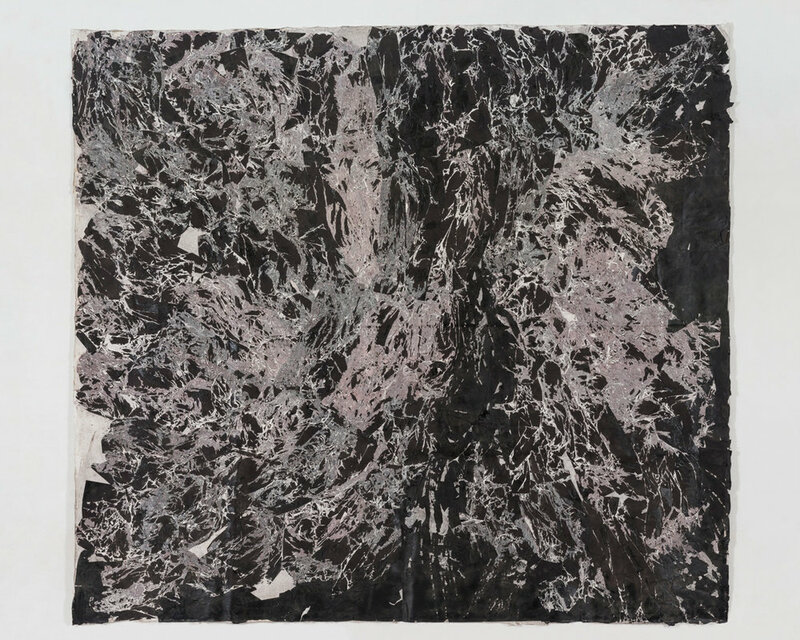 With its swarming hives of cellular spheres, deeply-entrenched dividing lines, and blood red paint flowing like rivers on the canvas, Mark Bradford’s “Lights and Tunnels”—the monumental centerpiece of his Scorched Earth exhibition on view at Los Angeles’ Hammer Museum—is at once cellular and societal. It refers in particular to the AIDS crisis and the 1992 Rodney King Riots. Bradford watched the latter unfold from his studio in Leimert Park. Although his work draws heavily from the city of Los Angeles and its people, this is the first time he has been the subject of a solo museum exhibition in his hometown. With a myriad of massively successful museum shows in New York, San Francisco, Boston, and Zurich under his belt, the artist described this exhibit as a “class reunion” of sorts. It is a homecoming and a chance to share his voice with the culture that inspired it. Raised by his mother in Santa Monica and West Adams, Bradford cut and colored tresses in her salon until 1991 when he enrolled at the prestigious California Institute of the Arts at 30 years old, earning his MFA in 1997. His artistic passion started early in his life as a pure love for making things, something he learned from watching his mother and grandmother sew. Bradford has breathed new life into a style known as abstract expressionism with his socially conscious works. When AbEx first gained popularity in the 1950s, its goal was to completely rid itself of all subject matter and emphasize pure aestheticism. Bradford infused this form with a meaning: the body and city in crisis. For Bradford, inclusion is at the very heart of his work. His canvases are geo-political maps, charting the movements and behaviors of society. Although often labeled a political artist, Bradford is hesitant to fully espouse this label to his paintings. “I think some of the materials I use and some of the ideas that I’m interested in point to a political-ness, but I also allow myself a lot of play, abstraction, and room for the unknown—for questions. It’s both. It has one foot in art history and one foot in civilization.” It’s the melding of these two worlds that allows us to see the connections and recognize society and expression as one. Stand for a moment in front of a Mark Bradford piece and one can feel the heat. The artist holds close to the notion that the “ideas surrounding art can have an influence on policy.” He argues that ideas have the power to spark interest and compassion for the plight of strangers because of their inherent connectivity. Artistic endeavors may seem trivial in comparison to the Goliath-esque political maze, but as Bradford has proven, the miniscule and colossal are truly one and the same.